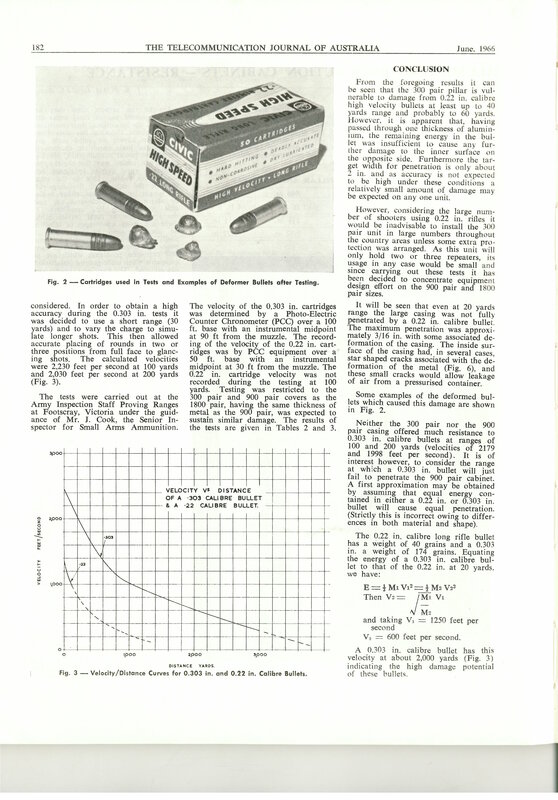 An unusual historic paper from 1966 where the Post Master General?s Headquarters Lines Section collaborated with the Department of the Army to subject aluminium distribution cabinets to ballistics testing ahead of possible rural deployment. The introduction of low-power solid state amplifiers for rural carrier frequency cables in the 1960s brought about underground installation in pits and the elimination of expensive equipment buildings. However, above ground installation has a number of advantages over underground, such as reduced water entry and corrosion resistance. The existing torpedo shaped aluminium distribution cabinets (or pillars) used throughout the metropolitan area had proven design, ready availability, low cost and sufficient space for amplifiers of up to 60 channels for balanced pair operation. 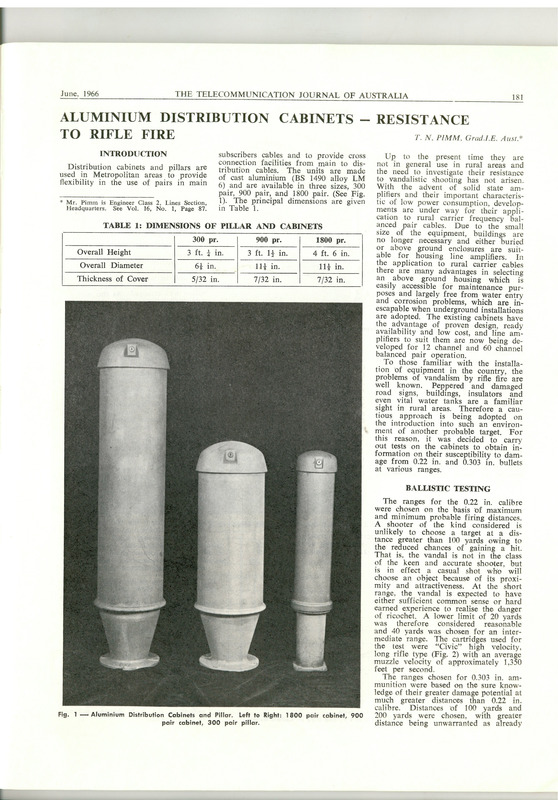 These cabinets were considered for rural deployment; however as the historical paper written by Mr T N Pimm of the Post Master General?s Headquarters Lines Section (TJA, 1966) cautions, ?for those familiar with the installation of equipment in the country, the problems of vandalism by rifle fire are well known?. Therefore the Lines Section took a more guarded approach before introducing another ?probable target? into that rural environment. 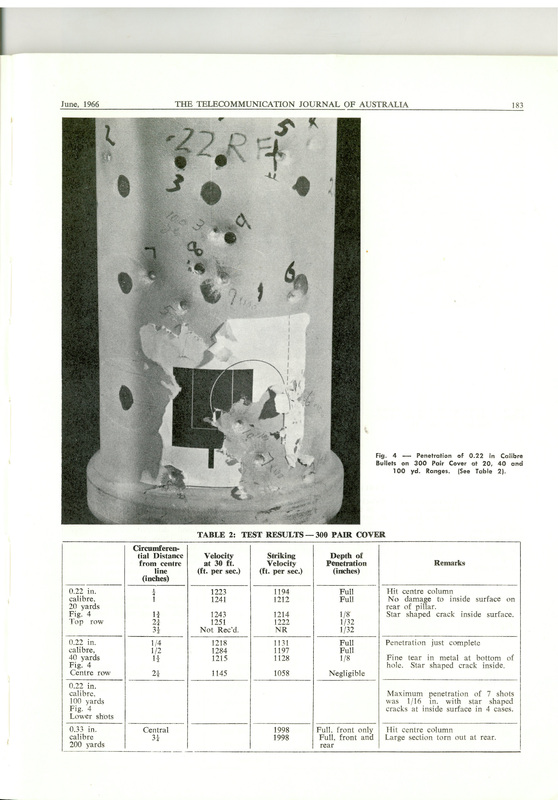 The paper describes ballistics testing with the assistance of the Department of the Army of 300- and 900-pair cabinets using 0.22 and 0.303 inch calibre bullets. The tests were conducted at such distances from the cabinet where it was assumed the vandal ?had sufficient common sense or hard earned experience of the dangers of ricochet.? Various calculations are provided for strike velocity and the results have been tabulated from extensive field testing. 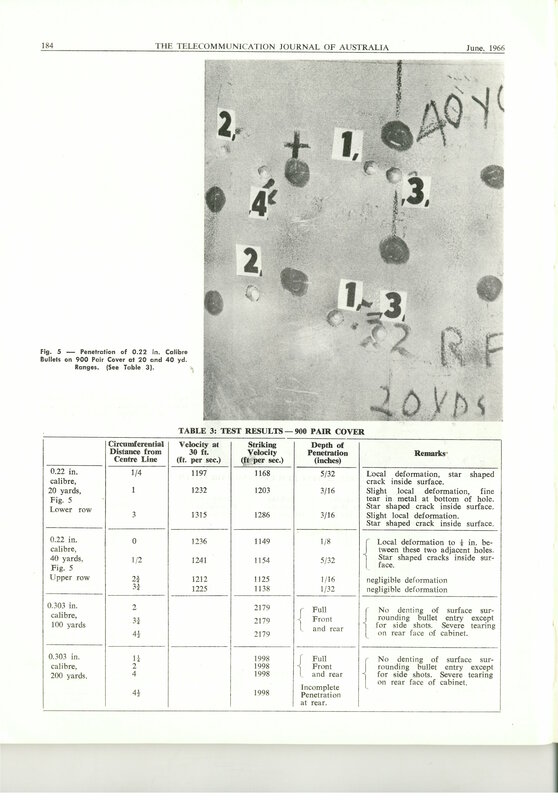 Both cabinets were no match for 0.303 inch calibre bullets which often passed through front and back and were prevalent in Australia following WW2. This is one of the primary reasons why above ground aluminium distribution cabinets did not find their way into the rural telecommunications landscape. The Melbourne Age published an article in April 2013 (Age, 2013) which describes the closing of a business called Cable Pillar Systems in Hallam which manufactured these aluminium distribution cabinets. Cable Pillar Systems supplied Telstra, and its predecessor the Post Master General?s Department, with approximately 70,000 cabinets since their design won the contract in 1956. The recent introduction of the NBN meant that the requirements for aluminium cabinets dried up and the company closed its doors in 2013 after more than 50 years of operation. According to the website GunPolicy.Org (GP, 2015) hosted by several local universities, Australians surrendered approximately one million rapid-fire long guns (mainly semi-automatic rifles and self-loading and pump-action shotguns) in the buy-back following the 1996 Port Arthur tragedy. By mid-2012 however, Australians had restocked with single-shot models to pre-Port Arthur levels. It is estimated that there are approximately three million civilian firearms in Australia currently. TJA . (1966). 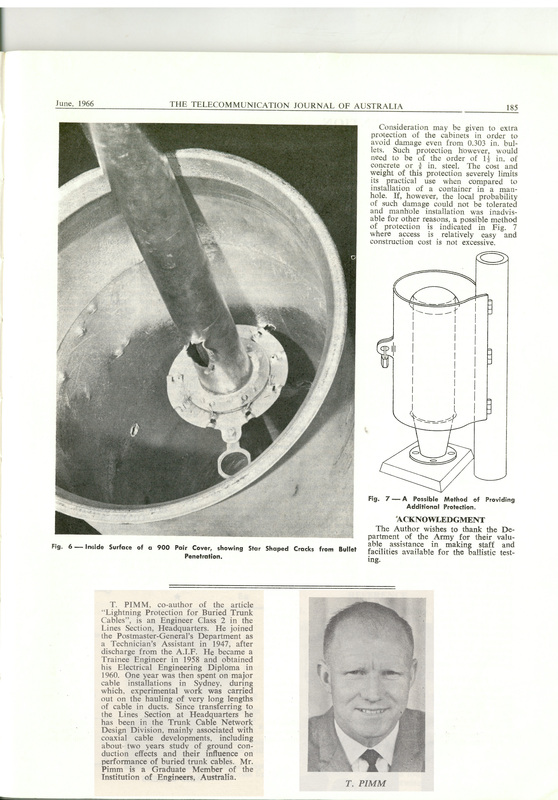 Mr T N Pimm of the Post Master General?s Headquarters Lines Section Telecommunications Journal of Australia, June 1966, Vol. 16, No. 2, pp. 181-185.